The W.E.B. Du Bois Library is a 28 story tower at the heart of the UMass Amherst Campus. With access to over 4 million volumes, 9 million items, 500 plus databases, trained staff, and libraries around the world-we can help you get your research or personal interests started. During the semester, the Du Bois Library is open from 11am Sunday through 9pm Friday, and then 9am-9pm on Saturdays. Students with a valid UMass Amherst UCard may swipe in through the front doors between midnight and 8am to access the building overnight during the week. The Lobby is the main entrance and exit of the Library. When you walk in through the front door, the Information desk is directly to your left. Stop by and ask them any question you have about the building or the Libraries resources and they will know how to help you. Across from the Info Desk are the self checkout machines where you can scan your UCard and then a book barcode and be all set with your borrowing. The Procrastination Station is located through the elevator lobby and is a retail dining location. The cafe has coffee, pastries, cold drinks, and sandwiches as well as seating and a handicap restroom. On the South College side of the Lobby is the new book shelf. Stop by every Monday to see the new selection of books that the Library has acquired. The shelf is also next to our interactive terminal where you can check out the library website and directory. The stairwells in the lobby will lead you downstairs to the Learning Commons. The stairs to the rest of the building are through the Stairwell Lobbies (through the double doors in the walls) and will take you all the way to the 26th Floor. Five elevators to access the rest of the floors in the building are at the center of every floor. The elevators can be quite busy during class change, so be sure to plan to get to the library a little early to allow for travel times. 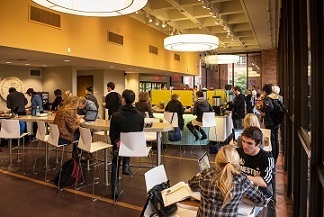 The Learning Commons is the largest space in the building and covers double the area of the tower, on the the lower level. The majority of Library departments are located on this floor along with public and UMass access computers, Reference Services, study space, the microclimates area, Room 25 (TBL), and restrooms. Circulation/Reserves and Learning Commons staff are now all located at one large service point, the Ask Us! Area. The Area is located between the two stairwells leading down from the lobby to the lower level. Circulation and Reserves staff can assist you with borrowing, renewing, returning, ILL, and all Course Reserves. The Reference Librarians and their student assistants also sit here to help with research questions. The LC and UMass IT staff here can help you with all the electronic resources in the LC and also has Campus IT staff to help you. They can help with remote printing, eduroam, and troubleshooting your computer. 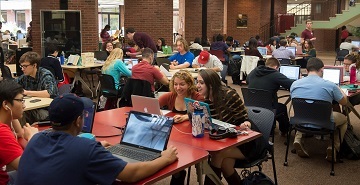 The Learning Commons itself has Macs, PCs, Glass study rooms (available to reserve by groups of three or more) equipment lending at Circ/Reserves, Photocopiers, Black and White and Color Printers, Scanners, a Fax Machine, Poster Printers, UCard Terminals, Reference Materials, and more! The Writing Center has their offices in the North End by the Microclimate furniture and IPO has a desk that is staffed after their offices close for the day in the South End. The Digital Media Lab on the third floor is home to the majority of the UMass Libraries equipment lending and AV resources. From equipment lending to 3D printing, the DML can help with so many different types of endeavors for a first year students. Equipment Lending is available at the DML desk for UMass Students. Cameras, camcorders, tripods, microphones, sound mixing equipment and more can be taken out for free for periods of either one or three days. Visit the link above to see the availability of all their equipment and visit the 3rd floor with your UCard to borrow something. Sound Recording Booths and Green Screen rooms can be booked by students for their use. 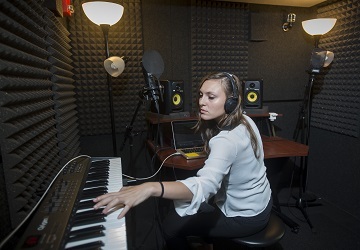 Large sound booths come equipped with keyboards and all four come with advanced microphones and audio mixing equipment. All Green Screen rooms are equipped with camera and lighting equipment, and both small and large rooms can be reserved. 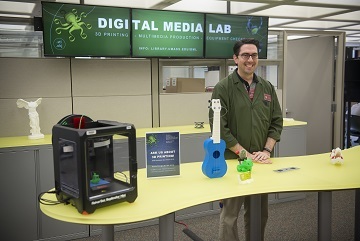 The DML is outfitted with 39 MakerBot 3D Printers that all UMass Amherst Students can use. Printing must be approved by a member of the DML staff (make an appointment to meet with them!) and is handled by weight (15 cents/gram.) Stop by the DML desk to check out the miniature Pokemon they print out! Software available through the DML is slightly different than in the rest of the Library. 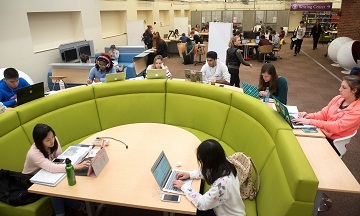 The 3rd Floor has both Mac and PC workstations available to students whenever the Library is open. The Learning Resource Center is the home for the majority of free tutoring for first and second year courses provided by the University. They operate by appointment and have three different options for student/instructor interaction. One-on-one tutoring sessions are available with qualified students instructors on the 10th and 13th floors of the Library, where you as a student can work with direct access to course materials and learn how to organize yourself and learn best practices for your study sessions. Supplemental Instructions are available for certain courses and are medium size groups that are instructor driven to review materials learned in class. The smaller group helps to facilitate more in depth coverage on materials covered in lecture with the ability of students to bring their questions with them. ExSel sessions are 10 person groups that are a form of collaborative learning between an instructor and students. Students work as a team to brainstorm what topics they want to review or what questions they want answered and bring them to an instructor to cover in session. UMass IT operates four computer classrooms in the Library along with a service point in the Lower Level. Room 1667 on the 16th Floor is a Windows Lab which offers classes during the day and has open hours in the afternoon. The Calipari Room on the Lower Level is a Windows Lab for Library use and can be used as a study space during advertised hours. 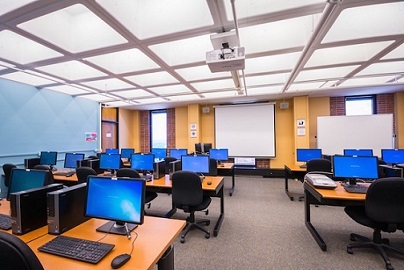 Room 25, the Team Based Learning Classroom, is a Windows Lab located on the Lower Level and is reserved for instruction during the day and then open to group use after classes end. Each classroom has a daily schedule which is posted in the lobby each morning near the elevators. UMass IT subscribes to numerous different softwares that are available to you as a UMass Student. A full list of software available on every UMass IT operated computer can be found here. Special Collections and University Archives (SCUA) is the home of all the original non-reproducible materials held by the UMass Libraries. From 17th century Quaker manuscripts to the entire range of Commonwealth Honors College Theses, SCUA is an amazing tool for researchers here at UMass and around the world. Special Collections include the manuscript, photographic, and digital collections in four main collecting areas; Social Change stemming from the W.E.B. Du Bois Papers, New England History stemming from local family and business collections, Innovation and Entrepreneurship from the Mark H. McCormack Papers, and the smaller areas of Japanese/Asian Culture, Gravestone Studies, and Prostitology. The University Archives comprise many of the university records dating back to the first days of UMass as the Massachusetts Agricultural College ("Mass Aggie") in the 1860s. Record areas include Departmental Papers, Faculty Collections, Student Theses, RSOs and Clubs Collections, Facilities Records, and Photographs from the Universities more than 150 year long history. To visit SCUA, you can either walk into the Reading Room on the 25th Floor or contact one of the archivists through their website to make an appointment or request a collection. The Du Bois Center strives to carry on the legacy of W.E.B. Du Bois by promoting the use of his papers (held in SCUA) and offering Fellowships, Scholarly Study opportunities, and running the W.E.B. Du Bois Home site in Great Barrington, MA. The Center offers events throughout the year, specifically the annual Du Bois Lecture every February as well as individual opportunities to meet with the staff to discuss Du Bois and his Legacy. Their offices are on the 22nd Floor, and their room is open to students for quiet study from 10am-2pm every weekday.